Residents who live in lush areas with lakes and rivers are generally familiar with the potential for flooding, and there are often local guidelines in the case of overflow that can pose a safety risk and cause damage. Although they do not experience consistent rainfall, arid regions are also prone to flooding, though more commonly in the form of a “flash flood.” These distinct flooding events are characterized by their rapid onset, generally within six hours of the causative agent (rain, the destruction of a dam or other barrier), and their potential to occur in areas that are not adjacent to a body of water (though they may also happen as a result of river overflow). Rain that is heavy enough to trigger a flash flood is often the result of a monsoon storm, which produces a heavy rainfall in a short period of time, or severe, prolonged thunderstorms that do not allow for sufficient roadway drainage. Despite their connection to dryer regions, flash floods result in more fatalities per year than standard flooding, causing 155 deaths, 230 injuries, and more than $2.5 billion in property damage from 2010 to 2012 (1). Many of the injuries that occur during a flash flood are caused by drivers who enter an area with fast-moving water because they perceive the flooded street to be safe. Depth on a roadway is easy to misjudge, and vehicles as large as an SUV can be carried away in 18 to 24 inches of water (2). Not just personal vehicles are affected; in a recent incident in northern Arizona, a tour bus carrying 33 passengers was carried 300 yards down a wash after a storm that produced less than an inch of rain. The swiftwater rescues required to extricate motorists are also some of the most dangerous for first responders “because of the unpredictability (3);” conditions can worsen quickly, and vehicles can be swept away during the rescue attempt. On the national and state-wide levels, several steps have been taken to reduce the number of preventable deaths that occur during flood season. Arizona’s “Stupid Motorist Law,” enacted in 1995 as a deterrent to entering flooded wash areas, allows the state to bill motorists for the cost of their rescue up to $2000 per incident. In order for the fines to be applied, the roadway must be submerged, and the driver must have evaded a barrier to access it. Taking a more educational approach, the National Oceanic and Atmospheric Administration’s “Turn Around, Don’t Drown” campaign highlights the dangers of entering a flooded area while in a vehicle. Flash floods represent an underappreciated hazard that taxes the resources of first responder departments and results in dozens of preventable fatalities each year. 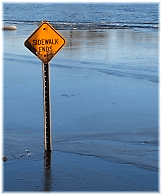 Residents of flood-prone areas can minimize the risks they face by heeding flash flood warning advisories, and taking simple preventative measures in the event of flooding, such as not entering washes or driving on submerged roadways. Through the cooperation of community members and the skill of rescue organizations, the risk posed by these abrupt events can be limited, reducing the potential for injury for both first responders and the general public. 2. Tarp, Keli, Flash Flood Safety in a Car; That Weather Show, NOAA, 2008.